This is a unique activity and does not fall under the regular club format. Students are given a situation with a problem. Finding and creating solutions from every day or learned knowledge, applying innovative and creative skills will release in them the scientist and inventor. Being able to “create” solutions will be their challenge and learning experience. The Makers of Things are taking up residence at CHIREC and are hosting Better by Design, a course that walks students students from Grades 5 to 9 through Stanford D.schools Design Thinking methodology to enable them to come up with innovative ideas to solve a problem and finally bring these ideas to life in a state of the art innovation lab. 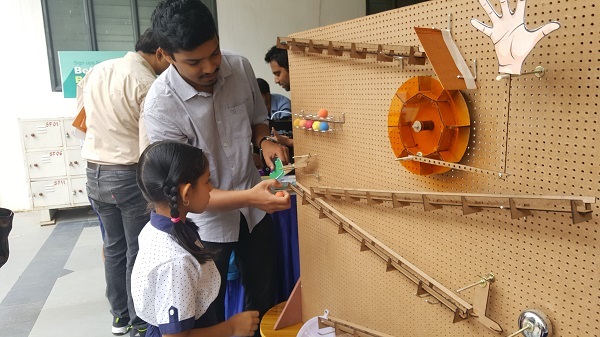 The 35 week course hosted by The Makers Of Things, is an initiative by CHIREC alums Soumeet Lanka and Krishna Teja Madempudi to promote a culture of innovation in young students. You can watch their pilot program in this video and we cannot wait to see what our students do! Moksha, Anvita & Sampriti hated untangling their hair, it took way too much time and effort. So they invented the Untangler 101! Aanya & Vedika were tired of helping their older siblings with their stuff. They wanted to help them but, with a twist.! For Arnav, Awanth and Sahas - Tying their shoe laces always got them late to school. Lets see what they did to solve that problem!